This is the third year I'll be participating in Artistic Horizons, January 19-23, 2015 at Montana State University's Helen Copeland Gallery in Bozeman, MT. Proceeds from this sale benefit Arts Without Boundaries ,a non-profit organization which brings free arts instruction and performances into public schools. HAPPY NEW YEAR! I'm stoked to have five of my paintings - all being shown for the first time - at the Coors Western Art Show in Denver, CO opening next week as part of the National Western Stock Show. Check them out online now and then go see the works in the Gallery at the National Western Club starting January 5, 2015. Purchase tickets to the Red Carpet Reception on January 6th here. The exhibition runs through January 25, 2015. Four fresh and recent paintings are in a new group exhibition at Altamira Fine Art in Scottsdale, AZ opening next week. Check out all of the work for Desert Mythos online now and then go see them in the gallery starting January 5, 2015. Two pieces are from Joshua Tree National Park and two from Anza-Borrego Desert State Park. One work was painted from memory. Can you figure out which one? I'm making frames and double-checking all of my tubes of paint, getting geared up to head out to Colorado next month for the Crested Butte Plein Air Invitational in Crested Butte, Colorado. I'll be painting on location in Colorado for about two weeks prior to the exhibition opening, which will be July 11-13. If you plan to be in the area please stop by and say hi! I'll also be teaching a 1-day painting workshop on July 3 in conjunction with the Crested Butte Center for the Arts - check it out! 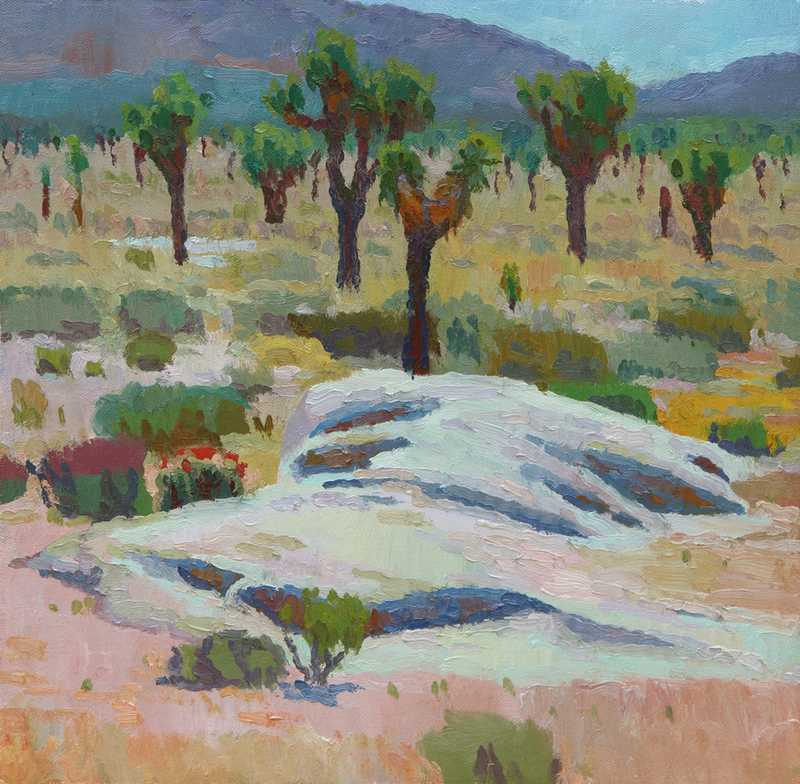 I really began to develop some of the color ideas during my Joshua Tree residency in 2009. In the desert in summer, especially in JT, there are strong shadows early in the morning and late in the afternoon, but for 5-6 hours when the sun is overhead there is hardly a shadow for miles. After struggling with it for awhile, I realized that when the shadows disappeared I lost artistically the ability to use value contrast (lights and darks) in a painting, but I still had color contrast. 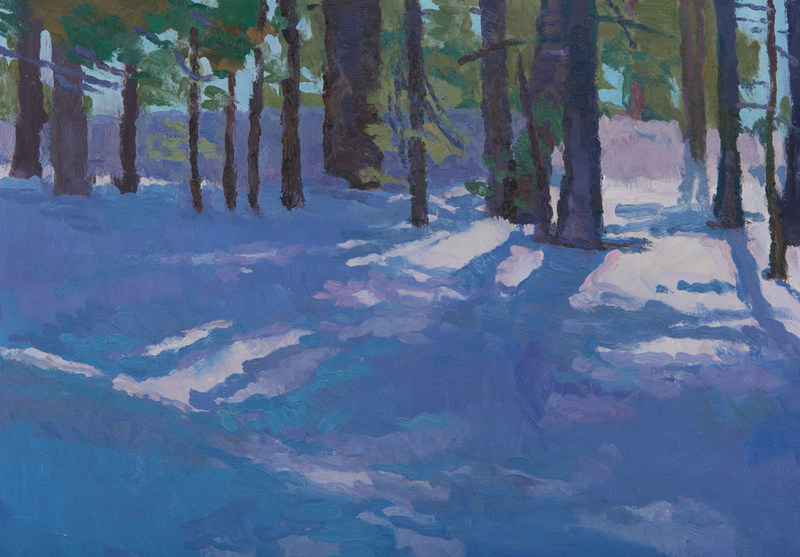 During the middle of the day (as in moonlight), we can still perceive distance, the masses and forms of boulders and trees, and the world continues to exist in three dimensions without the help of shadows (value), so I began to see that color was the way to try to convey that sense of light. One begins to mix all sorts of interesting colors to try and solve the problem. Painting is really problem solving. These color ideas apply to any situation and any location. But the particular brightness of the desert, where everything exists in such a high-key situation – sand, mountains, sky, brush – it provides a wonderful problem for exploring the richness of color. Just as a white tablecloth reflects the ‘truest’ colors of outdoor light (when we look at something ‘white’, we are seeing the full spectrum of visible light), the desert reflects a great deal of light back to our eyes, back into shadows. Students in my workshops often comment to me that they see color afterwards that they didn’t see before the workshop. When we study our visual world and what we see in terms of color and paint it is like exercising a muscle: the more often you use it, the stronger it becomes. In the scheme of art history, it also makes sense that our use of color continues to become more and more sophisticated. Color is a way we interpret our perceptions – truthfully, painting is another language, and not at all related to photography (which is itself another genuine art form). I think it is a language that almost everyone in the world understands, with its ability to bridge cultural barriers, because we all live in a color-filled, three-dimensional world, but most people are not very fluent in it (for many reasons). In her fascinating book Color, Victoria Finlay remarks that the section of wavelengths that we can see, visible light, includes about ten million variations of color. So the more colors I have on my palette, the more variations I can mix, and the more subtle my vision can become. As well as being descriptive, I can also use those colors to provide an emotional element. Finlay’s book is about the history and cultures surrounding actual paint pigments. The part I like most, though, is the idea that objects don’t have a static ‘color’ – they’re constantly changing throughout the different light of the day and over time. An orange carrot in the dark isn’t orange. Painting involves all the senses, not just sight. Sound plays a big role: One of my favorite parts of painting in the desert is crunching through the sand to my location. Also, when painting at night where our visual perceptions are reduced, audio increases and even small noises are very noticeable, like a lizard scooting by. Society today is so heavily bombarded by photography, film and other mechanical forms of art that we accept it as unbiased truth and don’t look any further or deeper (an individual camera lens doesn’t ‘see’ the same way our eyes do, in stereo, and a photograph can be incredibly biased. Painting in many forms has become a sub-category of photography, aimed at technical prowess, not in its own realm. ‘Color’ is a man-made invention, as is the concept of value. These terms are helpful to us in understanding what we’re seeing, but it becomes very hard to get away from names (i.e., a tree is brown and green, the sky is blue, rocks are gray) – what color is a ‘green’ tree in moonlight? Artists rely too heavily on science to ‘explain’ what they’re seeing instead of developing an eye for color. Art shouldn’t need an explanation. It’s interesting to know, but the scientific reason for why mountains appear bluer as they recede into the distance isn’t necessary to artists. The relationships between the colors however is very important – because, in other words, artists shouldn’t be painting a solely objective scientific vision of the world but should include their own subjective vision with all of the variables that entails. Have confidence in your opinion. We don’t have many historically-based examples of artists using rich color because stronger pigments weren’t available until fairly recently, so artists like Rembrandt had to rely much more on value. Aside from the recent history of Impressionism, when stronger color is used it tends to move away from perceived light in the natural world towards Expressionism or Fauvism, where color is ‘liberated’ from its role (i.e. when AndréDerain paints a bridge, he might paint it bright Cadmium Yellow.) If Rembrandt were alive today, I’m pretty sure he would take advantage of as many contemporary colors as he could, but his earthy palette was a result of the time he lived in. 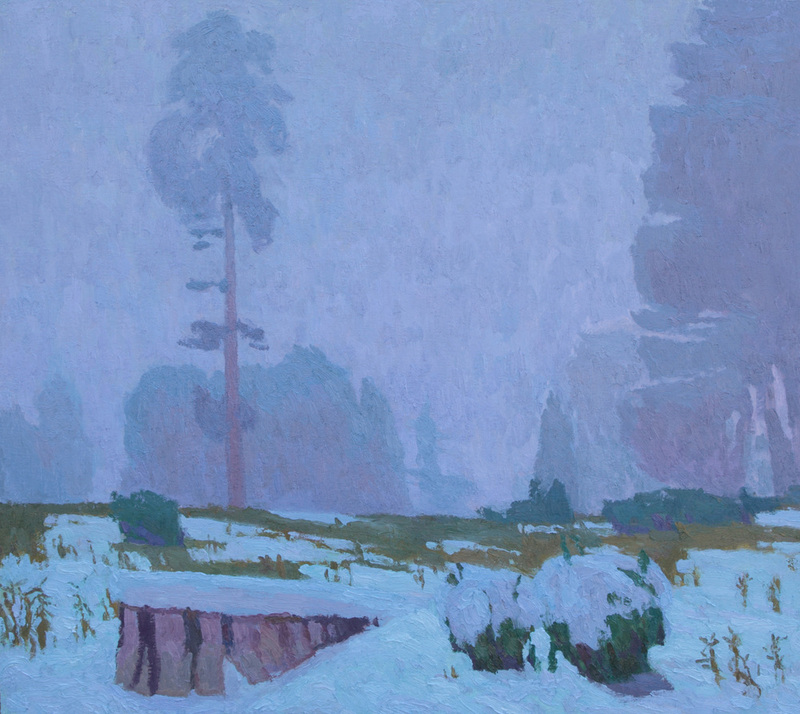 When someone looks at a painting with color, they tend to single out one spot of color – especially if they can name it, say a blue shadow – and look for that individual color in the landscape. Color doesn’t exist in a vacuum like that – that spot of blue is very purposefully placed next to whatever colors surround it, just like in the landscape. A couple of these paintings are very dependent on color contrasts – The Heat Lingers at Dusk was done after sunset. The rocky hill is silhouetted strongly against the sky in terms of value, but the greens of the Joshua Trees were visible in front of that and help create more atmosphere. There is space and depth between the Joshua Trees nearest us and the further hill. We can see the color shifts, but we really can’t see any defining features of the spiky Joshua Trees. Also, the hill is still 3-dimensional, so I needed subtle color shifts to convey the idea that the hill recedes away from us as we look up towards its peaks, angling in space. The Face in the Sand was a challenge – I could see SO many colors shifts in the shadow, but in the painting those colors have to exist in the shadow realm for it to work. It’s counter-intuitive to think that yellow can be a shadow, and ‘dark,’ because we think of yellow as a light ‘warm’ color. All that matters are getting the relationships correct. I try to ask myself what the light is doing, and find some of the color solutions that way. If the yellows were to get too light in value, they would begin to read as part of the sunlit sand on the ground. Snow Creek Canyon was done on a somewhat overcast morning, but this also needed to show a shift as we visually climb the mountain. The warmer salmony colors towards the base shift towards violets and greens as it gains elevation, shifting and turning away from us. Shadow of Where a River Once Was, a nocturne, also relies heavily on color contrast. The first impact is value-based with the brightly lit boulders in the foreground alongside a dark shadow, but then our eyes wander up and back into the canyon. It gets softer and softer, but our eyes can still perceive these little shifts, and value is unable to help us in that arena where it becomes incredibly soft. I’m trying to convey this softness by shifting and playing the colors off of each other while staying in the same value. The sky here is made up of bluish- and reddish-violets, violet-greens, and colors that go beyond naming, but are all relative to the other colors of the painting. Many people including artists think I’m a little nuts for painting in the dark, but if you stand in the moonlight for awhile, your eyes will adjust and you’ll see all sorts of things. The other pieces have some value contrast in them, but I’ll often use those areas as anchors in a painting to explore other color contrasts. 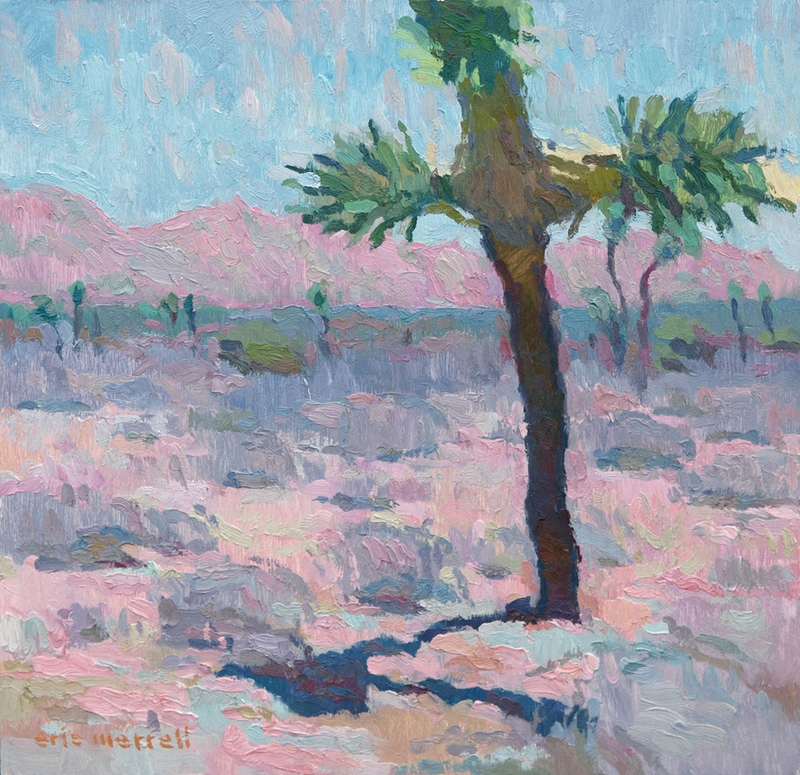 The central Joshua Tree in Echoes and Silence is grounded by its shadow, but I wanted to use that to get to the hill behind it, the bright orange-ochre with shifts towards red and violet, against the sky. It really looked like that, and could have been done without the tree, but that value contrast kept it from getting too abstract in this instance. I've just learned that the painting shown here will be included in the California Art Club's 102nd Annual Gold Medal Juried Exhibition in June, held this year at USC's Fisher Museum of Art. For me this painting is personally important as it contains my deep affection for the wild open spaces of the desert, but it was also contains artistic growth for me, pushing myself to paint new things I'm seeing, such as the subtleties of dusk and other areas of visual perception that can sometimes take on an abstract quality but are nonetheless made more "real" solely by context. In other words, our perception of the world is often abstract, but certain things ground that perception and help us understand it. I'm also honored to have been recently elected to Signature Artist Member of the CAC. These two paintings will be exhibited at the Randy Higbee Gallery in conjunction with the 3 days of workshops and lectures this weekend, June 1-3, 2012. I'll be teaching a still life workshop on Saturday. Some of the artists I'll be working alongside of include Frank Gardner, Logan Hagege, Glenn Dean, Dan McCaw, John Asaro, and Ray Roberts. These are a number of new pieces I've done recently - since moving closer to the Arroyo Seco, I've been painting there almost entirely. And since I'm temporarily without a studio, everything is done on location. 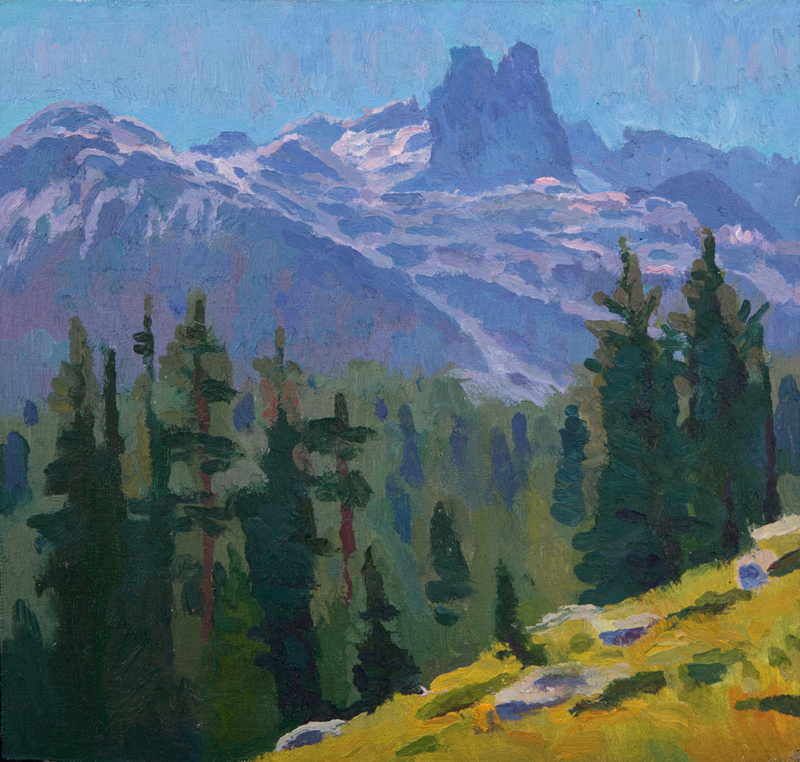 It's a fantastic place to paint, and as the birthplace of plein air painting on the west coast and California Impressionism, offers some pretty special light. Jean Mannheim, Franz Bischoff, Elmer and Marion Wachtel and William Lees Judson are just a few of the artists who lived on or near the Arroyo. 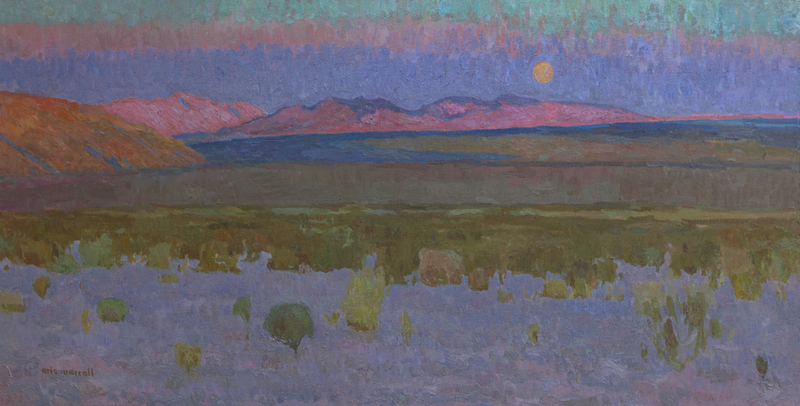 The high western edge of the Arroyo casts a shadow a little earlier than sunset and creates some unique painting opportunities - below are some examples of this: "The Arc of Evening" shows the eastern rim of the Arroyo and "In the Gloaming" looks up at the western edge. These three paintings, "Hillside Oaks and Shadows," "In the Gloaming" and "Down to Earth Sinks the Sun" have been great challenges. I spent at least three consecutive days working on each, developing the color and subtleties. 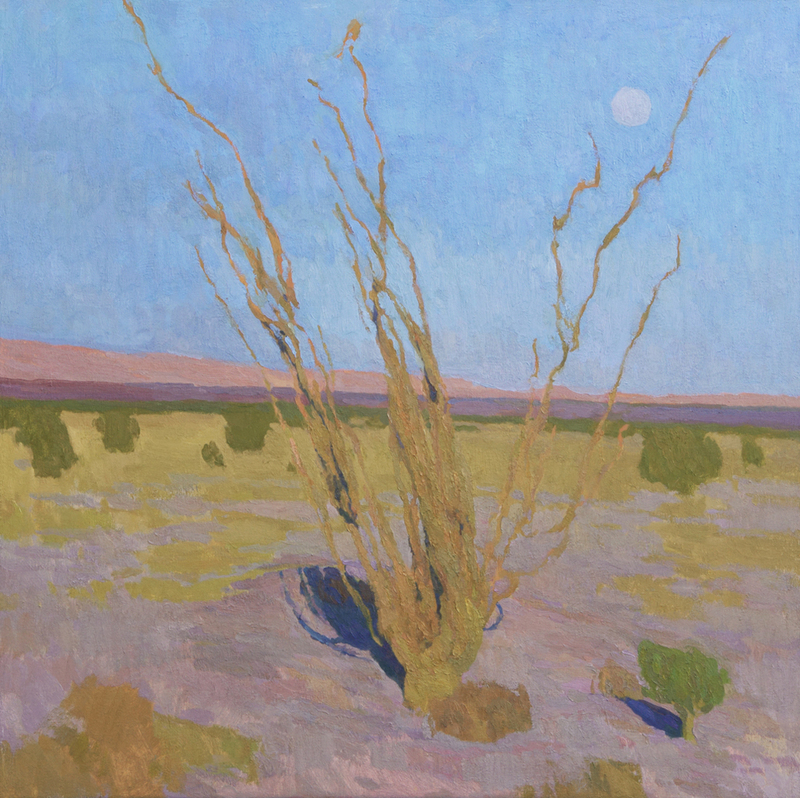 I'm excited to announce that I'm now represented by American Legacy Fine Arts (ALFA) in Pasadena, CA, and they will be hosting a solo exhibition of my desert paintings and still life next month titled "Romance of the West - and the Western Spirit." There will be an opening reception on July 16 from 5-7 p.m., and a catalog will be published to accompany the exhibition. It's really an honor to be working with this gallery and listed alongside the many great artists on their roster! Eric Merrell: Romance of the West - and the Western Spirit July 16-August 13, 2011 Opening Reception: July 16, 2011, 5:00-7:00 p.m.
American Legacy Fine Arts 949 Linda Vista Avenue, Pasadena, CA 91103 Open by appointment Tuesday through Friday 10 a.m. – 6 p.m., Saturday 11 a.m. – 5 p.m.